I'm using my university's exchange server to sync my calendar, contacts and todos with my iPhone (iOS 5), and this is working perfectly. However, there are (besides the "Birthdays" calendar) two other calendars "from my PC". At least they say they are - I have no idea where they would be on my PC, and why there are two of them (I've only ever synced my iPhone on one Win7 PC under one single user account). They also appear to be completely empty, but I'm not sure how to actually make sure that they are. What's more important, I'd like to remove them (not just hide them), but I don't know how. iTunes on Windows isn't a big help here. But perhaps I'm overlooking something. Can I remove those calendars? Or at least one of them? When the device is plugged into iTunes, look under the info tab, you will see an option to sync calendars, you can turn this off by unchecking the sync calendars box. Not the answer you're looking for? Browse other questions tagged iphone windows calendar . 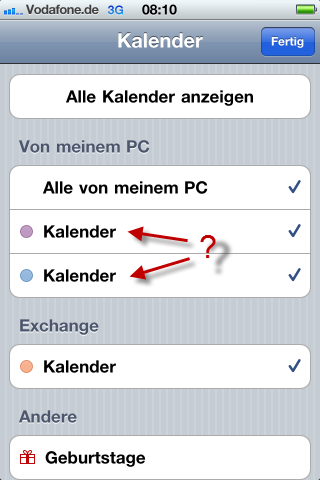 Sync multiple Google Calendars with iPhone Exchange… broken? 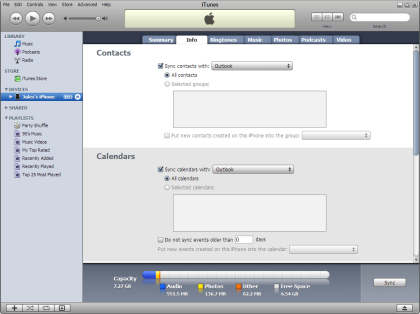 Can I have both iCloud and local calendars on my iPhone?